Posted on Thursday, May 6th, 2010 at 9:00 am. I am proud to be Taiwanese American because I feel that Taiwan has a lot to offer to the international community. I’m proud to be a part of it, and I hope to contribute to the world like so many other Taiwanese Americans have. I am a young professional currently living in the San Francisco Bay Area. To pay my bills, I am in high-frequency trading, but mostly I’m known for starting the World Cube Association, the international organization responsible for regulating competitive Rubik’s Cube solving. 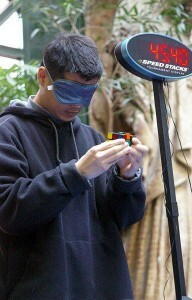 In 2005, I set the world record for solving a 3×3 Rubik’s Cube while blindfolded. 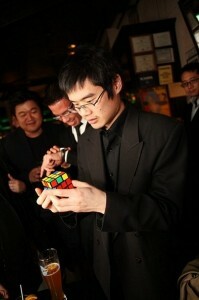 My brother and I also taught Will Smith to solve the Rubik’s Cube for the movie Pursuit of Happyness. I have been on a number of television shows such as Anderson Cooper 360, The Today Show, and Tonight with Jay Leno. Perhaps I am most remembered for being a cast member on the WB’s reality show, Beauty and the Geek 2. I make my living as a high-frequency trader utilizing algorithmic computer programs to interact with the market in various ways. Some things I do contribute to market liquidity, and other things I do are simply to make a profit. Outside of that, I am responsible for the world of competitive Rubik’s Cube solving. The organization I formed, the World Cube Association, oversees events on an international level, and recently I had the privilege of attending a competition in Taiwan. Besides my work an my involvement with the WCA, I enjoy some other very “Taiwanese” things like playing the violin and piano, and playing badminton. I also enjoy playing chess and have recently taken up rock climbing. I am a 2nd generation Taiwanese American. I was born in the United States and my parents are immigrants from Tainan, Taiwan. I am proud to be Taiwanese American because I feel that Taiwan has a lot to offer to the international community. I’m proud to be a part of it, and I hope to contribute to the world like so many other Taiwanese Americans have. Recently attending the Taiwanese Rubik’s Cube competition showed me how my ties to Taiwan, even though I very rarely visit, has contributed to producing a thriving Rubik’s Cube community, and now Taiwan has some of the top solvers in the world in 4×4, 5×5 speed solving, and 3×3 blindfold solving. We’re a small nation, but Taiwanese Americans have done a lot for humanity in many ways. I’m not exactly sure, but I would like to see Taiwanese Americans as our generation goes forward and the next generation comes into this world as contributors to our society, and also as a group that not only preserves its cultural roots, but also adapts to the changing times and environment. I am quite proud that I am able to converse in Taiwanese, and language is something I would like to see preserved. It’s difficult for me in Taipei when my peers are unable to speak Taiwanese as well as me, and I’ve grown up my entire life in the United States. I think it’s a wonderful language, and there are some ideas in Taiwanese that you simply just can’t express in English. I actually recently just spent two weeks in Taiwan and it was a fabulous experience. I had the opportunity to visit my aunt’s high school in Tainan and actually there’s an article you can see [here]. Taiwan is a wonderful place, and though to be honest, being born and raised in America, I am truly a foreigner, it doesn’t stop me from imagining what my life would be like had my parents stayed in Tainan. I think I could have had fun! That’s odd. Will Smith solved the cube once while interviewing for Princeton in Fresh Prince of Bel-Air. Yeah, I’ve heard of that, but never seen it. If I could see the clip, I would probably be able to point to specifics, but most likely the episode on Fresh Prince of Bel-Air was faked. Will Smith did not know how to solve the Rubik’s Cube when he started filming Pursuit of Happyness. He can honestly solve the Rubik’s Cube on his own now. Though, the scene in the movie was not necessarily genuine, because the second half of that taxi scene was filmed first. You rock ……. I went wordless after watching your video on you tube , awesome teaching. I will be really happy if you guide for 2*2 , mirror cubes , 4*4 cubes .